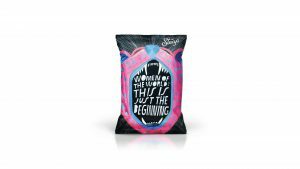 PLANO, Texas — Stacy’s Pita Chips, founded in 1997 by female entrepreneur Stacy Madison, is celebrating the power and achievement of women by unveiling limited-edition bags. Created for Women’s History Month, the designs feature artwork from over the years to honor the courageous women that have helped shape our nation’s history. Inspired by the artwork and signs from pivotal moments throughout history, the bags will be available for a limited time to consumers who register at StacysStandsWithYou.com starting March 8, 2017. For each consumer registration while supplies last, the Stacy’s brand will make a $10 donation to Step Up to support critical work mentoring young women and helping them become confident, career-focused and prepared to achieve their full potential in business and in life. Stacy’s is also inviting people to submit their own inspirational signs and poster artwork for a chance to see a small number of designs featured on the bags released nationally at the end of the month. Each bag houses a Snapchat Snapcode that, when scanned, provides a way for people to get involved –such as supporting women’s causes like Step Up and engaging their local representatives. People can go to StacysStandsWithYou.com to learn more about the campaign, order bags, make a donation or submit their artwork. Stacy’s Snacks is one of the many brands that make up Frito-Lay North America, the $14 billion convenient foods business unit of PepsiCo (NYSE: PEP), which is headquartered in Purchase, NY. In addition to Frito-Lay, PepsiCo business units include Pepsi-Cola, Quaker Foods, Gatorade and Tropicana. Learn more about the Stacy’s brand online: www.stacyssnacks.com and www.facebook.com/stacyspitachips. Step Up propels girls in under-resourced communities to fulfill their potential by empowering them to become confident, college-bound, career-focused, and ready to join the next generation of professional women. Connect at suwn.org.